Well guys, here are the iPhone photos I was talking about in my last post.. sometimes you just got to do what you got to do. I suppose it's better than nothing. However, I will be back shooting looks with my sis once I am home for Labor Day weekend. I am super excited about that! I have already been planning some looks and posts so stay tuned for more content to come! As for today's look, I am sharing about one of my recent purchases: the kimono of my dreams. Since I have been buying so many staple pieces here lately which are basically all solids, I was on the hunt for more patterns in my closet. 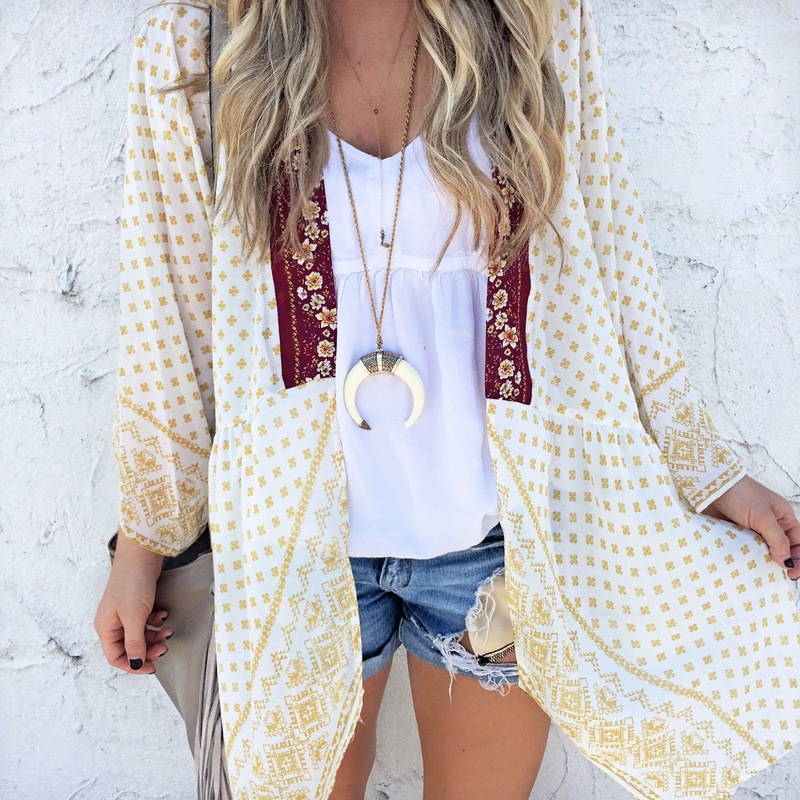 So while the warm weather lasts, so will the kimonos which means you will probably be seeing more from me! But if I am being honest, any and every kimono is a kimono of my dreams for the following reasons..
Reason #1: The comfort factor. They are lightweight, flow-y, and long...the three things I look for when buying tops. I always feel more comfortable when I know something is covering my behind when I wear shorts, so the longer, the better. Reason #2: Make-or-break an outfit. Without the kimono I'm wearing here, my outfit would have been an everyday look. 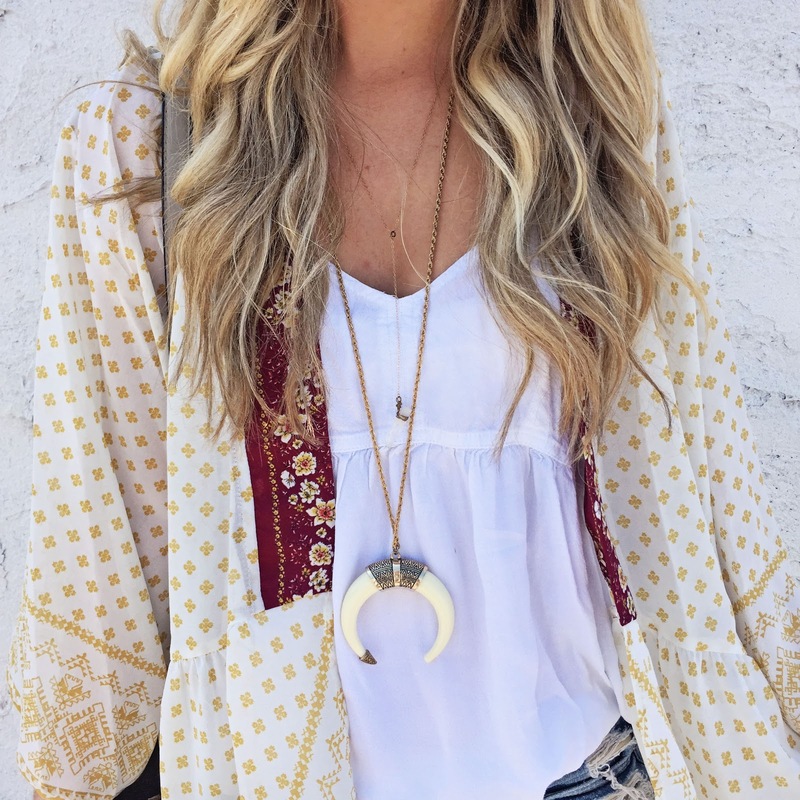 By simply adding the kimono, it completely turned the outfit around (in a good way)! Plus you can basically look cute without spending any time putting a look together. Reason #3: Layering. No matter what I wear, whether it's pajamas, jewelry, or even sweaters, I am always layering of some sort. So naturally, I love kimonos for that reason alone. They are perfect additional pieces. Reason #4: Versatility. You can dress them down, or dress them up. For example, you can wear them as a beach cover up, with leggings, shorts, jeans, dresses, maxi's, you name it. Reason #5: Well, because they are just SO CUTE. End of story! Am I right? !